The more one irrigates his lands, lower the amount of rainfall he can expect in the coming years. While agricultural lands are seeing drier weather, Indian cities are getting short but intense periods of rain and the subsequent water logging. This is the irony that a group of researchers explain. They blame land use patterns for it. A team from India and the US analyzed data collected by the India Meteorological Department (imd) since 1951. 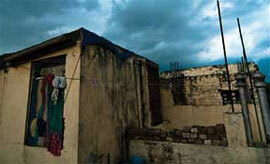 Mean monsoon for the country was found stable but average rainfall in India’s northwest decreased by 40 per cent. Satellite images showed increased agricultural activity in the areas. The team proposed that continued irrigation caused the northwest region to become as much as 300 per cent wetter in recent years. The wet surface causes cooling of the air that weakens the low pressure zone necessary for monsoons to enter this zone. Therefore, with more irrigation, there is low monsoon rain. With low monsoon rains, more irrigation is needed; the cycle continues. The findings of this study will be published in W ater Resources Research. “You need a warm, dry surface to advance the monsoon low pressure system, simply speaking,” said lead researcher Dev Niyogi, associate professor at the department of earth and atmospheric sciences and department of agronomy at Purdue University in usa. These warm and dry conditions are provided by urban landscapes which end up getting as much as 94 cms of rainfall in a single day. imd and nasa satellite data showed places with high rainfall coincided with areas getting urbanized. This study was headed by Chandra Kishtawal from the Space Application Center in Ahmedabad. It will be reported by the International Journal of Climatology . Niyogi explained what this means for cities like Delhi which is urban but has farmland all around. “From our analysis, we anticipate rainfall would be heavier downwind of the urban region and less, upwind. This means the possibility of heavier rainfall would be on the fringe of the urban-rural region.” But he also pointed out for different cities, the local meteorology will always matter in determining the rainfall pattern. While researchers agree land use changes like increase in agricultural activity and land degradation affect monsoons, they are not convinced. “Our results suggest there would be more rainfall due to more soil moisture which increases humidity. Our analysis shows rainfall is increasing over northwest India,” said M Rajeevan, scientist at the National Atmospheric Research Laboratory in Andhra Pradesh.